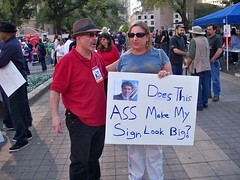 Just start talking about cutting the budget and Texas Democrats come simply unglued. And that was exactly what happed at the Harris County Democratic Party's planned "Day of Outrage" that drew a small number of supporters and nearly an equal counter demostration from Conservative activists. The event was attended by 200-400 teachers, union workers and immigrant rights advocates. Counter protesters numbers about 150-250 and were organized by Janet Thomas, Catherine Engelbrecht of King Street Patriots and several Tea Party activists groups. The Conservative protesters began their rally first, showing up about an hour before the scheduled Democrat rally. They gathered near the rear of the park to display their signs and speak to all who would listen. As the Democrats began to arrive, there was polite conversation and exchanges between members of the opposing groups. Members of both groups seemed to be wandering between the two protest areas and were having polite discussion with each other on areas where their opinions differ dramatically. Here is a discussion between Democrat Activist Egberto Willies and some of the Conservative Tea Party protesters. Differences between the two groups can easily be seen by the signs they carry. Here are some looks at the signs of the times as displayed at the Texans Day of Outrage Rally and Counter-Protest. Things stayed peaceful between the two groups until radical, self-proclaimed Marxist, Professor David Michael Smith (South Texas College of the Mainland) showed up. Things always seem to escalate when Prof. Smith is on the scene. First he began by trying to stop me from taking pictures and videoing the event. This is a common tactic from the left. If they don't like you, they try to block your camera and start trying to move you around, creating frustration they hope will lead to physical confrontation. After the police informed them they could not interfere with my right to be there, they moved on to create a loud confrontation between Smith's group and a group of Conservative activists who had quietly come to the front area to listen to the speaker who was about to begin. Once the police got Smith and his clan under control, the program was about to begin. They started with the Pledge of Allegiance followed by a nice prayer. Smith and his anarchist friends made light of that. Then as KPFT's Geoff Berg began his service as emcee of the event, another incident happened that would also involve Prof. Smith. A man who appeared to be from the Conservative group was standing near the front of the crowd attempting to video Berg's comments. One of the organizing ladies attempted to block his camera. Despite appeals from Berg to let the guy film, liberal activists started getting more aggressive with the man, sticking signs and umbrellas in front of his camera. Even grabing for his camera and pushing him back. The man, whom I later learned was former Houston mayorial candidate Charles Dan Cupp, responded by moving closer to Berg and the crowd got more agressive. More shoving ensued and Cupp began to defend himself by pushing and punching back. As this escalate, Harris County AFL-CIO President, E. Dale Wortham, stepped forward and assaulted Cupp by grabbing his camera. Cupp then punched Wortham with his other hand which was holding a small megaphone. Cupp moved sharply forward and was now standing beside Berg's podium. At this point, Prof. Smith who came from about 40 yards away when the schuffle started, grabbed Cupp (yet another assault) moved him backwards about 25 feet or so and had Cupp under control. Then for some reason, he turned and threw Cupp to the ground (yet another assault) at which point the police arrived and arrested... you guessed it, Cupp for assault. AFL-CIO President Dale Wortham grabbs Mr. Cupp's Camera. Prof. Smith grabbs Cupp around shoulders and neck and moves him backwards about twenty-five feet. Prof Smith throws Mr. Cupp to the ground before police arrive. Mr. Cupp should file charges against Mr. Wortham and Prof. Smith for their assaults against him during this event. Their behavior was outrageous. It doesn't matter how much you disagree with someone, you can't stop them from shooting photos or video in a public place and you certainly can't lay your hands on someone. And they say they are the "peaceful" people... I this this shows otherwise. Contrast the behavior in these videos with that of the earlier video where the Democrat was in the Tea Party area. All in all, I would say the event was a bust for the Democrats. As "Outraged" as they were supposed to be, even former Harris County Commissioner Sylvia Garcia expressed disappointment about the size of the crowd from the speaker's podium when she said, we should have this entire park filled back to the street. Perhaps the left should take some lessons from Tea Party Activists about how to gather a large crowd. On to more important things... like the votes in Austin this week on Voter ID and several other issues. It's absolutely absurd how polar opposite your testimony of the actions that occurred are from the truth. Hilarious how you make it look like Mr. Wortham is "grabbing" Mr. Cupp's camera. What actually happened was Mr. Cupp took a swing at Mr. Wortham without any retaliation from Wortham. If you think I'm making this up, or taking sides, feel free to watch ANY of the video footage from the incident. Oh hey, I think you even posted some in your post! Mr. Kojak, clearly you are not related to the old Telly Savalas character who was a great detective. It appears your eyesight is blinded by your ideaology. First, I embeded a photograph in the story that clearly shows Wortham's hand on the camera. This is an assault against Mr. Cupp. Secondly, I included two videos which, is you will look closely at what is going on, you will see a series of assaults by the liberal activists on Mr. Cupp which finally led to his striking out in self defense against Wortham. This was followed by the excessive force response from Professor Smith constituting yet another assault against Mr. Cupp. Please take some lessons in detective work from the great detective Kojak of the past and open your eyes to the truth.